Back on Cybertron, Thundercracker was a master of using sound to his advantage. His fear-housing sonic booms were tuned perfectly to the composition of the atmosphere. Sonic vibrations from his attacks could be felt thousands of miles away, generating panic in those nearby, and deep unease even on the other side of the planet. Odd that they've removed any mention of his doubt in the Decepticons there. Character wise it was the only thing the poor guy had going for him. It was an interesting element (that, up until IDW, I don't think has ever been played with) that set him apart from the other Decepticons, with their army almost entirely made of mad scientists or dumb muscle. It was this bizarrely ignored bit of character that made him (alongside Sunstorm) my favorite of the Decepticon army. Well, that and his lovely, lovely color scheme. Skywarp seems to get a lot more love thrown his way, but I've always thought Thundercracker's blue and red looked darn spiffy. 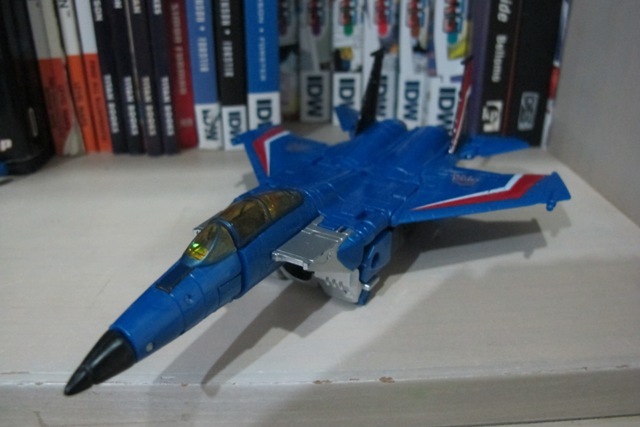 Thundercracker, of course, is an F-15 Eagle, which is likely the jet you think of when someone says "fighter jet." 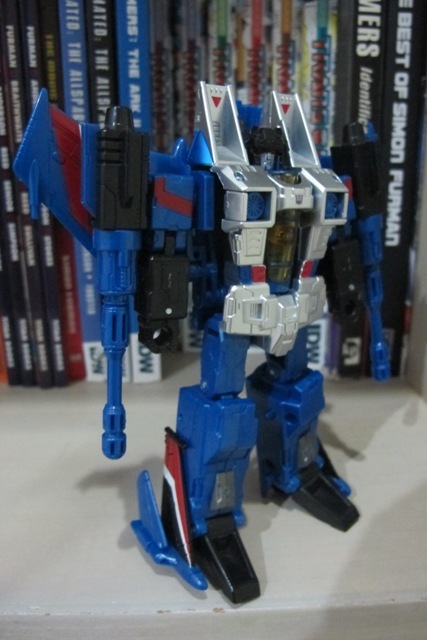 It's an iconically generic form, and Thundercracker wears it well. The Classics Seeker is one of the best jets we've gotten as far as hiding the robot bits, and I daresay Thundercracker has the best color scheme of the lot. His blue is absolutely magnificent; somewhere between royal and navy, and just shiny enough to give it depth. He's mostly accented with red, but some white, black, and silver show up too. His layout is very similar to his original toy, with the differences being more in shape than in placement. The oversized missiles are still there, but at this point in the Seeker game changing them would be a problem more than a positive. After a simple but fun conversion, Thundercracker stands in robot form. A lot more silver and black shows up here, along with two squares of gunmetal on his shins. It's worth noting that his face is painted silver with bright red eyes, which gives him definition and personality that Classics Starscream suddenly lacks. The Classics Seeker mold, at this point, is over four years old and has been used well over a dozen times, but somehow Thundercracker's as tight as if he were the first use. All of his joints hold a pose, his cannons have no issues staying in their slots, and he fits together perfectly in both modes. His articulation may be lacking by current standards with ball-joints only at the shoulders and hips, hinges at the elbows, wrists (inwards), knees and ankles, and swivels at the neck and shins. If this is your first Seeker, he may seem a bit limited at first, but if you've had one for a while you probably already know how to work around the limitations. Overall: I love him absolutely to pieces, but if you're not in love with the colors or a raging Thundercracker fan then he's just another Seeker. 10/10 to 8/10 depending.